What percent of the grid is shaded pink? 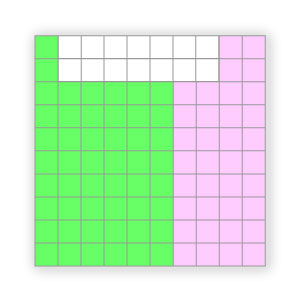 What percent of the grid is shaded green? What percent of the grid is white? Write each fraction as a percent. Write each percent as a decimal. Sarah hits the ball 6 times in 20 times at bat. What percent of the time did she hit the ball? What is her batting average (which is the percent of the time she hits the ball) expressed as a decimal? Determine the missing equivalent fraction, ratio, or decimal in the chart. What decimal does A represent in the chart? What fraction does B represent in the chart? What ratio does C represent in the chart? What ratio does D represent in the chart?